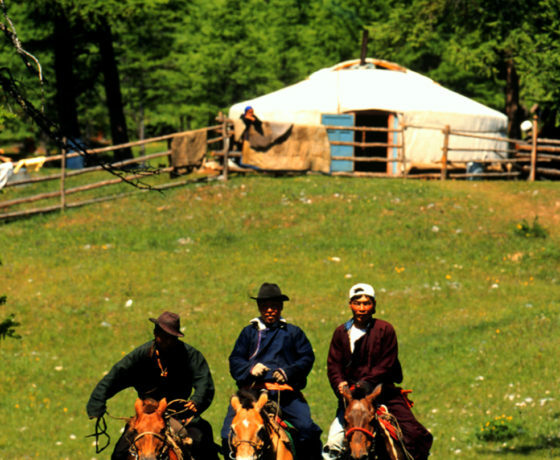 Join Cultural Crossroads for a cultural trip to Mongolia, a country with ancient Tibetan-Buddhist traditions, monasteries and friendly spiritual people. 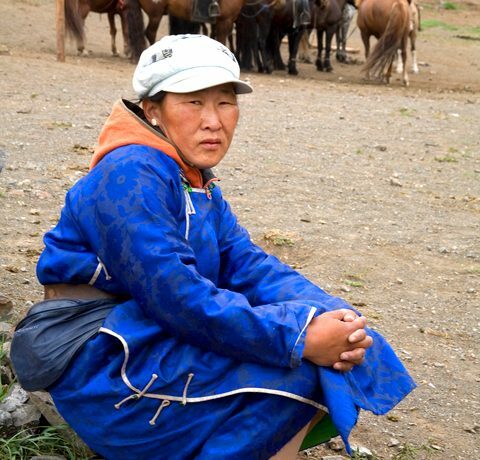 Meet lamas, hear the low tones of the horns used to call the lamas to the temple and observe their daily rituals. 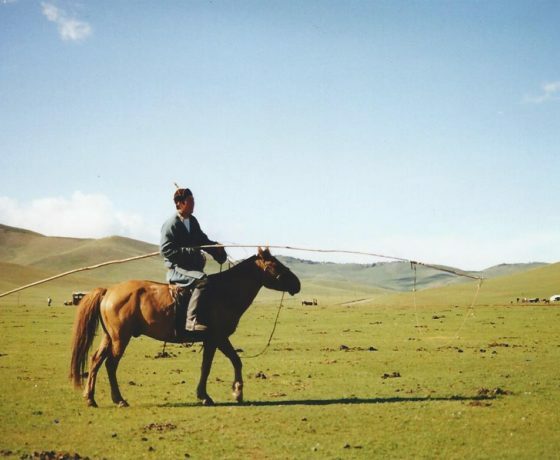 Our travelers have special access to the Arts Council of Mongolia and its art collection. Meet local artists and crafts people. 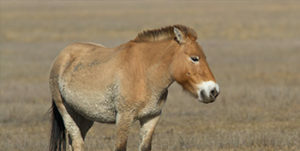 Enjoy the Hustain Nuruu National Reserve, home to the last remaining species of wild horse, the Takhi. Learn about current conservation efforts and the status of the herds found within the reserve. 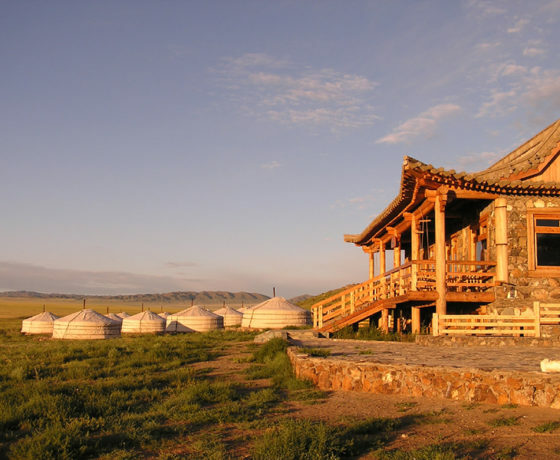 We will see the Kharakhorum, site of the 13th-century capital of the Mongol Empire of Genghis Khan. 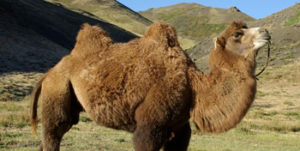 Take in the remote and stunning wilderness of Mongolia when we stay in South Gobi, home to Bactrian camels, Argali mountain sheep, goitered gazelle, golden eagles, saker falcons, jerboas (similar to kangaroo rats) and many endemic reptiles. The Gobi is also home to some of the Northern Hemisphere’s rarest and most elusive mammals such as the dhole, snow leopard, wild camel, and Gobi bear. 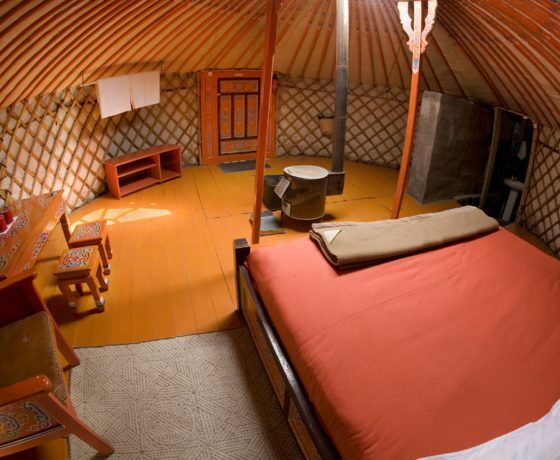 Cultural Crossroads travelers will stay at the Three Camel Lodge in gers (Mongolian tents), an eco-lodge located near the Gurvansaikhan Gobi National Park. Our trip ends with a visit to a nomadic family leading a local movement to protect and preserve the Bactrian camel populations. 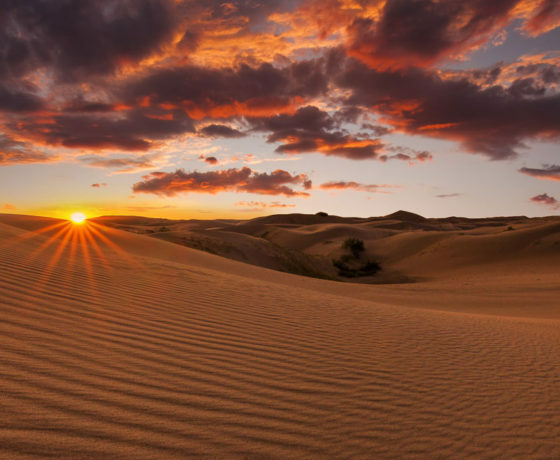 Majestic fiery sunset in the Gobi Desert. 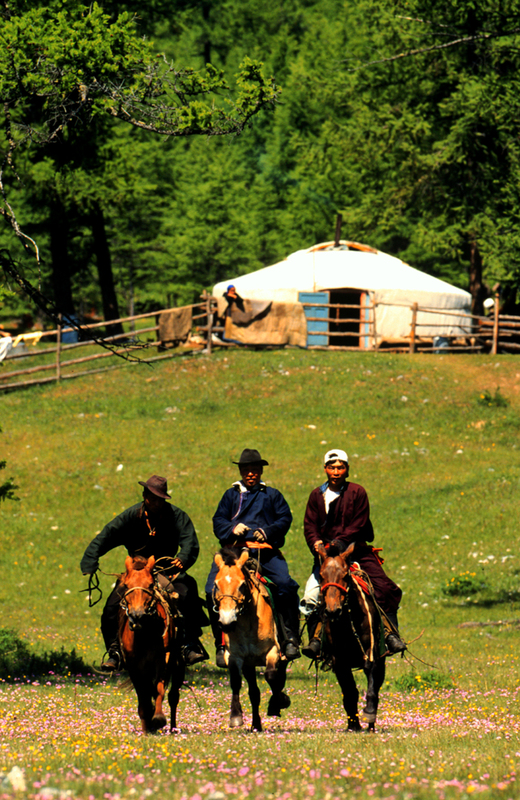 Mongolia. Arrive in Beijing or Seoul and connect to Ulaanbaatar, Mongolia flight. 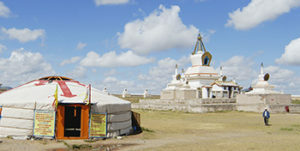 The contrast between ancient traditions and the dawning of a 21st century democracy is most visible in Ulaanbaatar, where traditional gers and Buddhist monasteries coexist with modern high-rises. Upon arrival at the airport, you will be welcomed by your Cultural Crossroads’ guide and transferred to the Ulaanbaatar Hotel, a comfortable, centrally located hotel within walking distance of various museums and shops. Begin the day with a visit to Gandan Monastery, the seat of Buddhism in Mongolia. 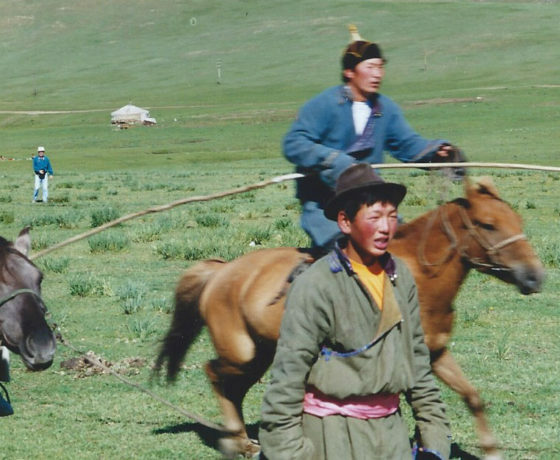 Woven through Mongolia’s nomadic culture is a rich Tibetan-Buddhist tradition with ancient Shamanist practices still evident. 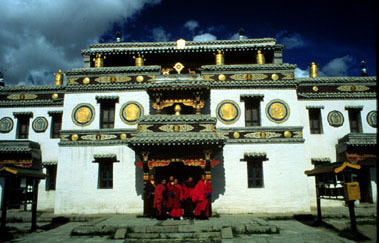 Although Buddhist monasteries were either destroyed or converted into museums during the Stalinist purges of the 1930s, Gandan Monastery continued to operate as a “showpiece” for government officials. However, in spite of the government’s efforts to suppress Buddhism and other religious beliefs, Mongolia’s spirituality persisted and a significant resurgence of Buddhism began in 1990 when Mongolia became a democracy. Monasteries across the country have opened their doors to worshippers, and the few lamas who survived the purges are training a new generation. Experience these exciting developments first-hand at Gandan Monastery and meet the local lamas. Strolling through the monastery grounds, you will hear the low tones of the horns used to call the lamas to the temple and can observe their daily rituals, including the reading of sutras (teachings of the Buddha). Also visit the recently renovated Chenrezi and Kalachakra Temples, as well as the magnificent statue of Migjid Janraisig (“the lord who looks in every direction”). 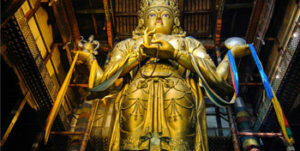 This 82-foot high statue, gilded in pure gold and clothed with silk and precious stones, completely fills the biggest of Gandan’s temples. Next, drive through downtown Ulaanbaatar to the National History Museum for an excellent overview of Mongolia’s history and culture. 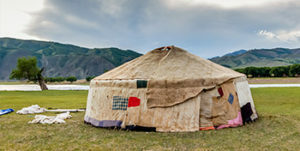 The newly remodeled museum displays traditional implements of daily nomadic life including Stone and Bronze Age artifacts, historical costumes of Mongolia’s minority tribes, sacred religious relics, and agricultural, fishing and hunting equipment. 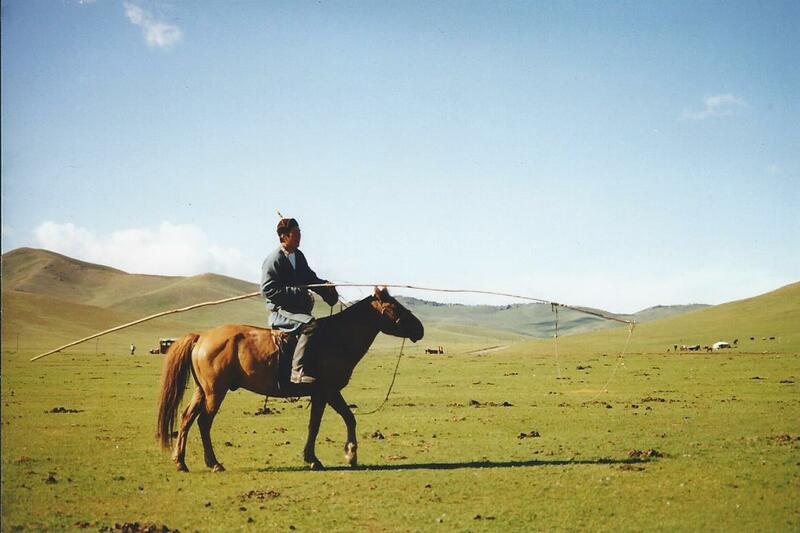 In the afternoon, gain special access to the Arts Council of Mongolia and its art collection. 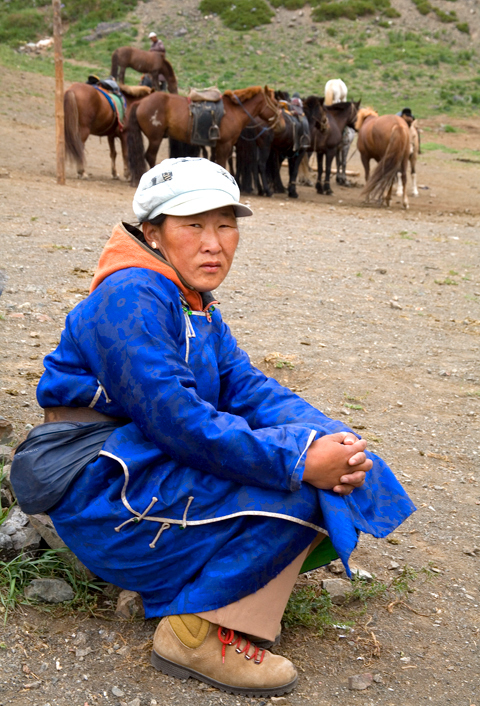 Learn about the different artists of Mongolia and meet local artists and craftsmen. Enjoy a dinner at a fine local restaurant and overnight at hotel. 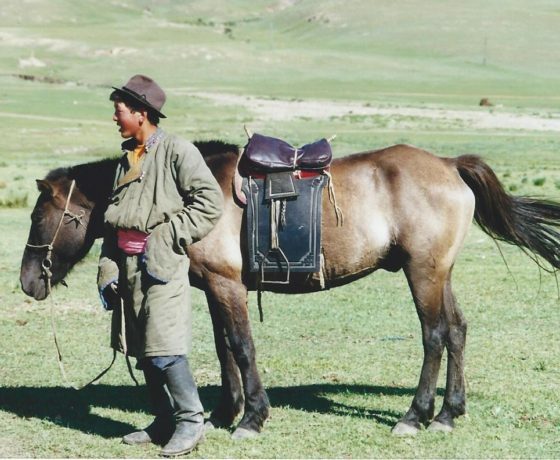 1994, twenty-five years after they became extinct in the wild, the Takhi was reintroduced into the wild from zoo populations by the Foundation for the Preservation and Protection of the Przewalski’s Horse, a Dutch organization which flew 16 horses from the Netherlands to Mongolia. 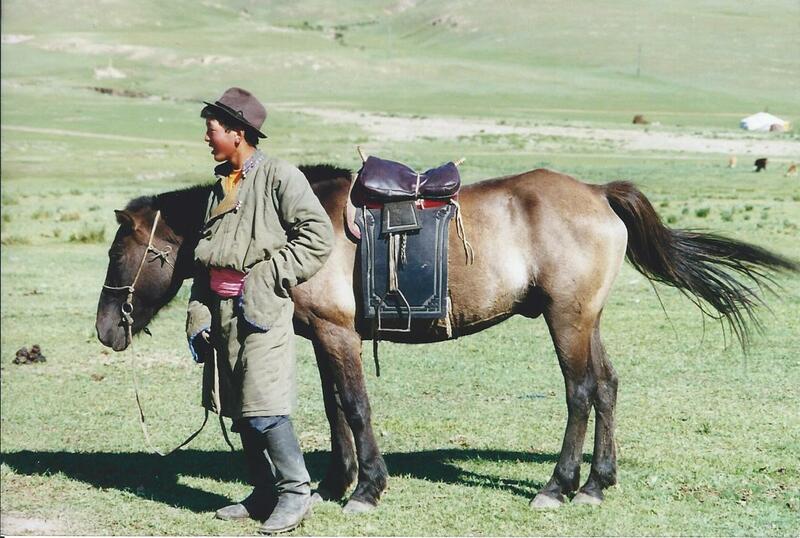 Since then, well over one hundred healthy foals have been born in Mongolia. Learn about current conservation efforts and the status of the herds found within the reserve at the visitor’s center before trying to spot these beautiful horses in their natural habitat. After lunch at the park drive to Kharakhorum, site of the 13th-century capital of the Mongol Empire. The empire created by Chinggis Khan and his descendants was the largest contiguous land empire in recorded history, and its scope has never been matched. 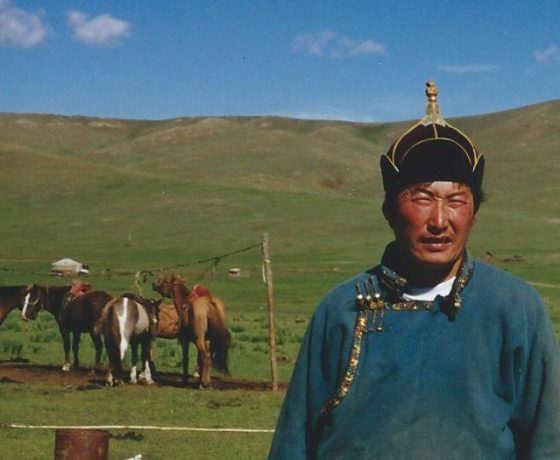 Chinggis Khan’s son, Ogedei, created the beautiful and legendary Kharakhorum to serve as the heart of this monolithic empire. This bustling, momentous capital was abandoned by Khubilai Khan for his new city in Beijing and later fell into ruin. There are only a few traces left, but Mongolia’s largest monastery, neighboring Erdene Zuu, was reputedly constructed from the ruins of Kharakhorum in the 16th century. Surrounded by 108 stupas, Erdene Zuu has been a place of Buddhist activity for more than 1,000 years. Overnight at ger camp. After breakfast explore Erdene Zuu Monastery. Take a stroll around the surrounding environs including the former sight of Kharakhorum city. 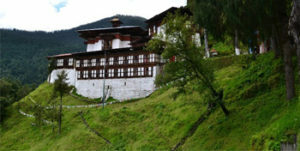 Explore the monastery grounds and observe the monks as they perform their prayers and rituals. 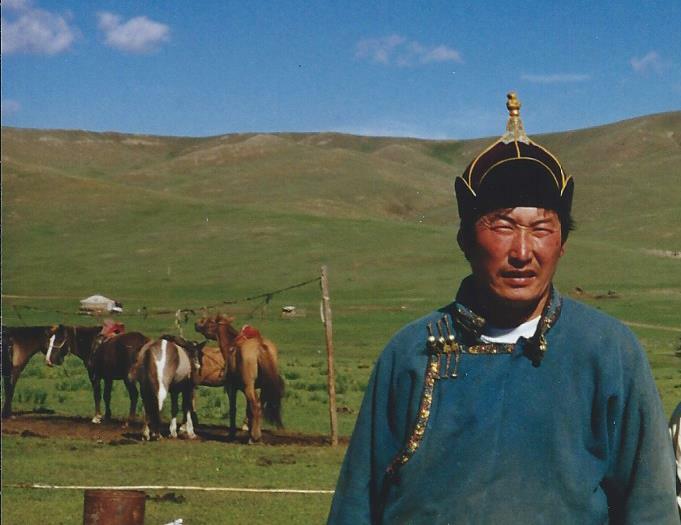 We will meet with one of the head lamas of the monastery and visit the local school affiliated with Erdene Zuu. Later, enjoy lunch on the bank of Orkhon River. Afterwards, visit Kultegin Monument, erected during the Turkic Empire in the 8th century. Built in honor of the prince of the time, this large and magnificent statue has been widely researched by archeologists from various countries, most recently from Turkey. Many roof tiles can be found on the site while you walk around this area, devoid of any settlement. 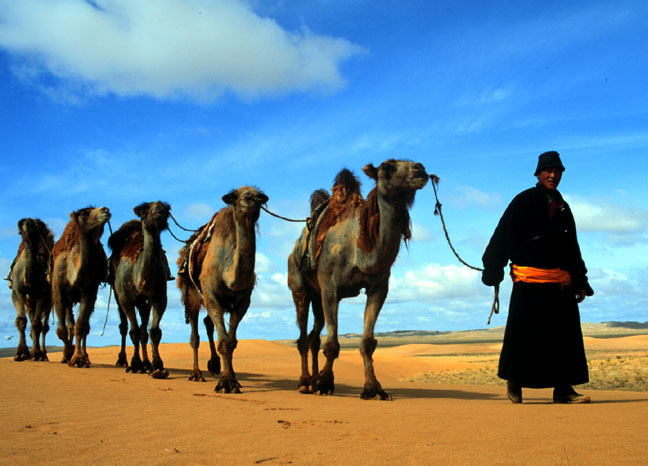 all the world’s arid lands, the Gobi (which means simply “desert”) has about it the greatest air of mystery, perhaps because it lies at the heart of Asia’s remotest hinterland between the Siberian wilderness to the north and the Tibetan Plateau to the south. Contrary to the sterile sameness that the word “desert” suggests, the Gobi holds many fascinations including sites of some of the most important paleontological discoveries of this century. For the next four days, explore the stunning landscape of the Gobi, habitat for Bactrian camels, Argali mountain sheep, goitered gazelle, golden eagles, saker falcons, jerboas (similar to kangaroo rats) and many endemic reptiles. The Gobi is also home to some of the Northern Hemisphere’s rarest and most elusive mammals such as the dhole, snow leopard, wild camel, and Gobi bear. 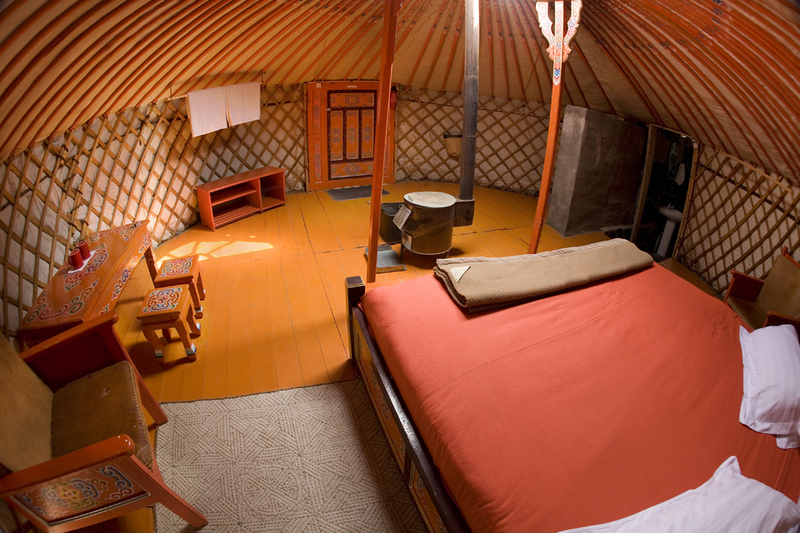 In the afternoon arrive at the Three Camel Lodge, Nomadic Expeditions’ eco-lodge located near the Gurvansaikhan Gobi National Park. Spend the afternoon resting in your ger or on the veranda where you can catch a glimpse of passing nomads watering their livestock at the Three Camel Lodge community well. 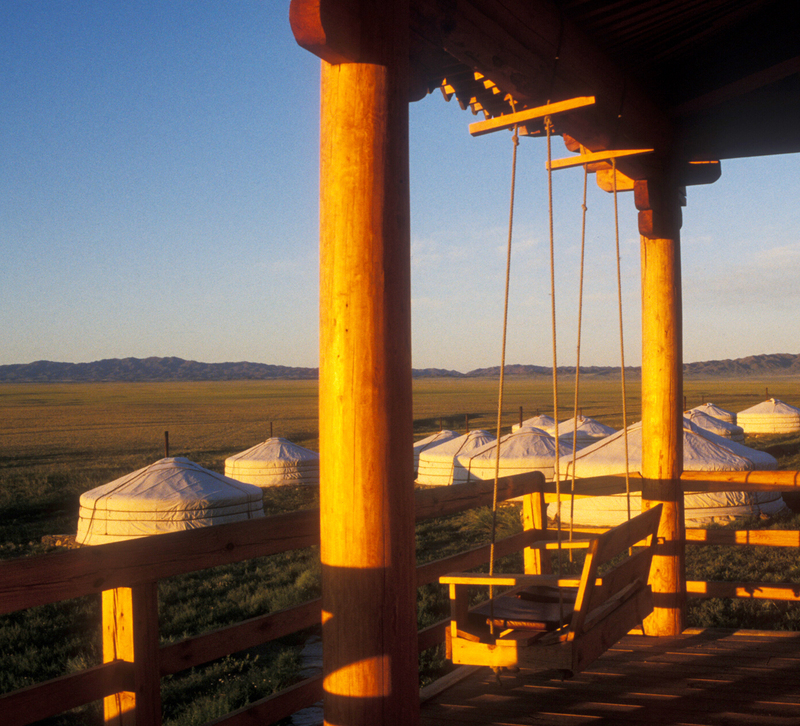 Wake early in the morning to the sight of the sun rising over the vast Gobi landscape. After an early breakfast, drive to Yol Valley National Park (2.5 hours), cradled between the foothills of the Altai Mountains. An ancient river carved this surprisingly green valley. Now, its remnant streams create ice formations that sometimes persist as late as July, making a strange contrast to the surrounding desert. 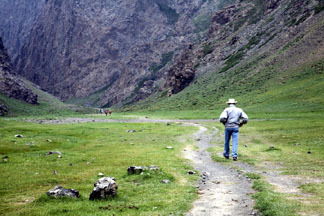 A hike through the valley allows you to discover habitat for indigenous vulture-like lammergeiers, Altai snowcocks, ibex, yaks and Argali mountain sheep. After exploring the area, visit a local natural history museum for an overview of the flora and fauna of the area. In the afternoon, we drive to Bulgan meditation temple in Hoorhon Devseg valley. This is a first meditation temple in this area since 1990s built by local Lama Buyan and his disciples, We hike up to 1800 meters uphill to the mountain and visit this meditation temple. Return to the lodge. 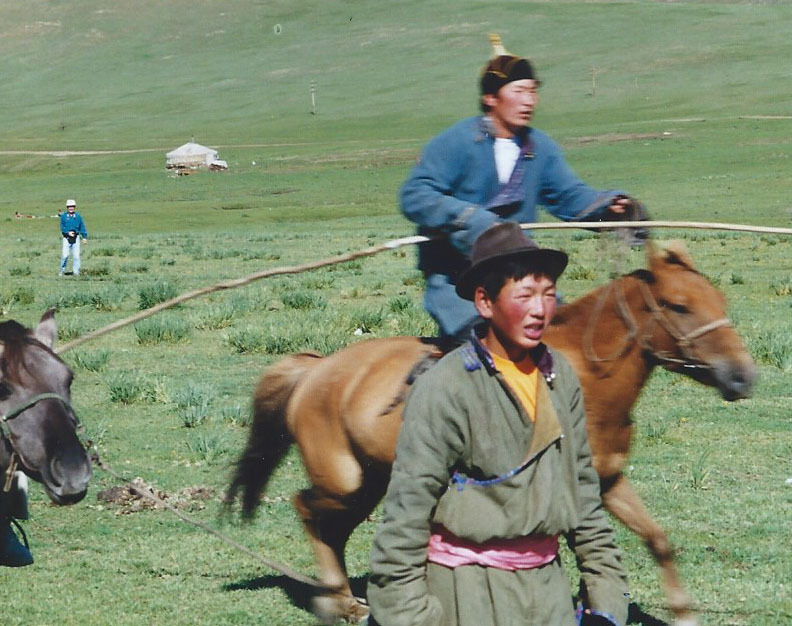 After breakfast, visit with a nomadic family leading a local movement to protect and preserve the Bactrian camel populations, which as been steadily declining. 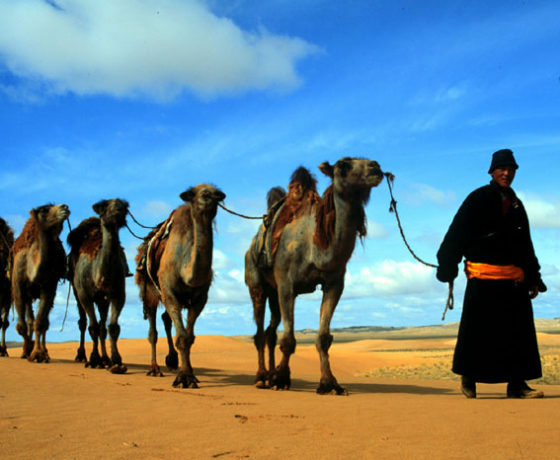 You will learn about the co-dependency between Gobi nomads and their camels and hear stories about why camels are so sacred to local people. 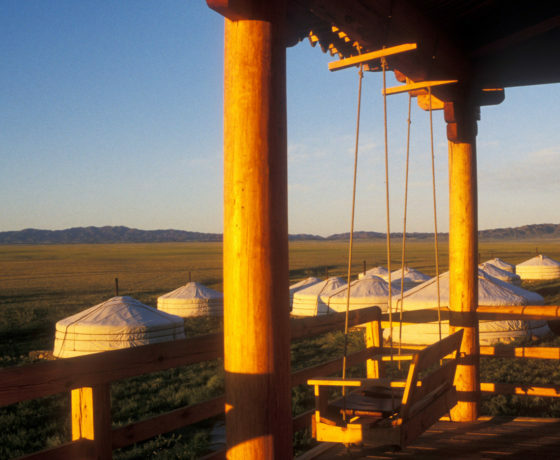 Afterwards, drive to Moltsog Els, one of the few regions of the Gobi covered by sand dunes and explore the area. 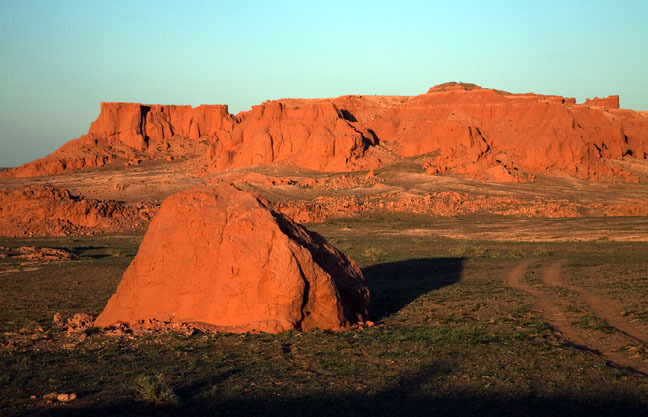 After lunch, travel to the legendary “Flaming Cliffs” (1 hour), named for the red-oranges stone which glows brilliantly at sunrise and sunset. It was here, in 1922, that Dr. Roy Chapman Andrews and his exploration team from the American Museum of Natural History found the first nest of dinosaur eggs the world had ever seen. 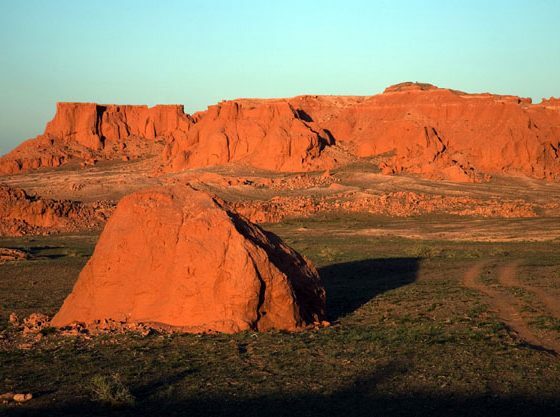 To the trained eye, the ancient formations of the Flaming Cliffs are rich with fossils, and paleontological expeditions continue to make significant discoveries at this site. Soak in the tranquility and beauty of the landscape while enjoying a picnic dinner on the cliffs while the sun sets. 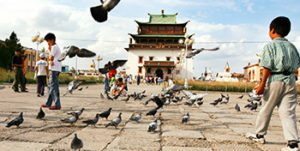 Transfer to the local airport and fly to Ulaanbaatar in the morning. The afternoon is free for last minute sightseeing and shopping. 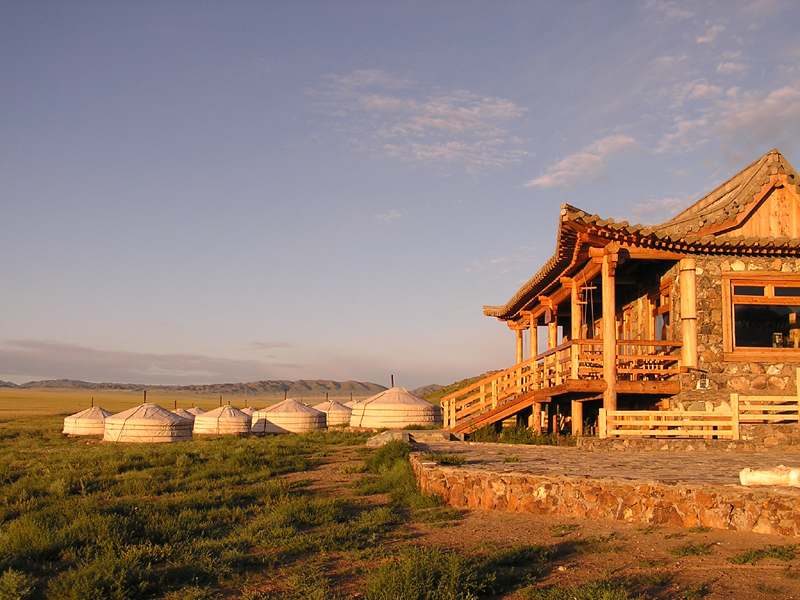 In the evening, enjoy a performance featuring traditional Mongolian dancers and hoomi (throat) singers, followed by a farewell dinner at a local restaurant. Overnight at hotel. After breakfast, transfer to the airport for departure or independent travel.